MANY OLYMPIANS will tell you just how real the post-Games blues are – and Katy Marchant is no exception. 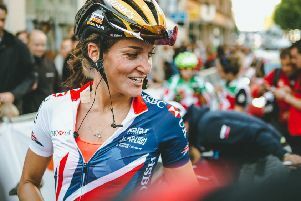 But with the European Championships now just a few days away, the Leeds track cyclist is convinced the excitement for racing is firmly back with her. Marchant rode to bronze in the individual sprint in Rio last year, a breakthrough moment for the 24-year-old after beginning her sporting life as a heptathlete. Like most, that success prompted a rest from the bike but, with 14 months having since passed, Marchant is back on track for cycling glory. The sprinter is set to take part in the keirin and individual sprint in Berlin next week, glad to be back on the bike with a strong summer behind her and a busy winter programme now on the horizon. “There was a period after the Games where there was downtime, people always talk about that being a strange time but you never really appreciate that until you’re there and experiencing it for yourself,” she said. “The summer leading up to the Games is always really intense so you do need to have that downtime, taking the pressure off yourself a little bit because it is tough being a professional athlete. “We’ve put a lot more focus into this season’s winter, it’s a stepping stone heading towards the World Championships and Commonwealth Games next year and then onwards towards Tokyo. “This is the first major where we’re really looking at the results and gathering the information about how training has been going. With plenty of rest from the bike, Marchant admits it took a bit of time to get back into the rhythm of things early in the summer, now feeling further towards her best on the track. But with this her first European Championships since stepping onto the Olympic podium, this competition takes an extra edge for Marchant. She insists she is not one to feel those pressures however, confident expectations will remain at a minimum despite an Olympic medal being among her possessions. And with the TISSOT UCI Track World Cup also a potential part of Marchant’s 2017, each race has its increased significance as the countdown to Tokyo 2020 continues. “Part of me does put some expectation on myself, I’m not the kind of person that gets much of it from everyone else, but people probably do look at you when you’re an Olympic bronze medallist,” said Marchant, who could feature at the TISSOT UCI Track World Cup in Manchester next month. “I’m still the same person and doing the same things, so I’ll get out there and see what happens. “We’re building back out there and still three years out from Tokyo, we want to see where we are and take things forward. We are massively an Olympic-based programme, but it is a stepping stone route to there and we have to make sure we hit those little goals to get there.